This set includes: One Beautiful 48" Garden Patio Table and Four Matching Chairs with Optional Sunbrella Cushions and Throw Pillows. 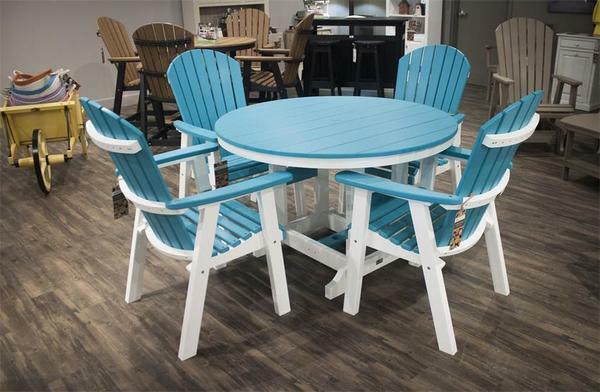 When it comes to hosting an outdoor get together with your loved ones, our Amish Poly Five Piece Garden Dining Set is sure to be the perfect place to relax and enjoy the day! Available in three different heights, with an array of beautiful poly color choices and comfy Sunbrella Fabric cushions, you're sure to find a set that will compliment your outdoor decor and reflect your own unique style. The Garden Patio Table comes with aluminum frames that will add strength and durability to the dining surface, along with an umbrella hole on the top and bottom with a matching plug, giving you the option to add an umbrella on those warmer summer days. Ground to Arm Height: 26 1/2"
Ground to Seat Height: 18"
Ground to Arm Height: 31 1/2"
Ground to Seat Height: 22 1/2"
Ground to Arm Height: 35"
Ground to Seat Height: 26 1/2"